For three days in the fall of 2006, an Internet writers' community came together in a heart rending vigil for a tiny baby girl, born before her time and taken from this world far too soon. In her precious hours with us, however, Gabrielle reached more hearts than most people do in decades. Her life was not measured by the number of breaths she took but was—and continues to be—measured by the depths of compassion she inspired. Anyone who bore witness to this event can never again claim that online relationships are not real—or that they are in any way, shape, or form lesser than those taking place offline. The virtual candles glowed just as brightly, the e-hugs were just as warm, and the abundance of love just as palpable. I know that I, for one, will never be the same. Many of the stories and poetry contained in this volume of Coming Together were written in the wake of Gabrielle's passing. Proceeds from its sale will be donated to BLISS, the U.K.'s premature baby charity. Your purchase will help the next baby who leaves the womb too soon take more breaths and touch more lives. Thank you. 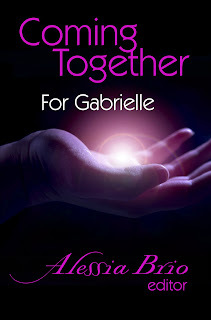 Coming Together: For Gabrielle is a multi-author anthology of sensual fiction & poetry edited by Alessia Brio. ALL proceeds from the sale of this volume benefit BLISS, the U.K.'s premature baby charity.